HEART “RED VELVET CAR” – IS 100% PURE CLASSIC HEART! HEART – Ann and Nancy Wilson have revived their very own Classic Rock roots, to such an extent that Red Velvet Car is unmistakably 100% pure Heart Classic Rock. I don’t think I can hear a single note on this new Heart album to tell me otherwise. 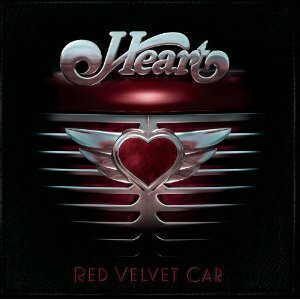 Released on August 31, 2010, on Sony Legacy, Red Velvet Car is the thirteenth studio release from Heart. This new album of Heart songs won’t reveal an Even It Up from 1980’s Bebe le Strange, nor will you hear anything remotely close to What About Love, from their 1985 self titled album Heart. What I hear is Ann and Nancy Wilson making a triumphant return to the sound that captured my very own heart, some thirty plus years ago. Throughout the decades, I’ve listened to so many bands try to reinvent themselves, through sound, style and/or persona. Sure, Heart may have dabbled in some of their very own “change” in the mid 1980’s, only it was never drastic enough for these two incredibly talented sisters to cease making memorable Rock Music. I went along for that stylistic ride back in 1985… seeing Heart in the arena setting of The Hartford Civic Center, with the ever charismatic Autograph as the opening act. There was always a place for Heart… in my Metal heart, ever since my first album of theirs was spinning on my turntable, that album being Bebe le Strange. While there are those bands that changed and never recovered, there are still other’s that seem to have forgotten their Rock ‘N’ Roll roots with an almost defiant glee in their eyes. Not Ann and Nancy… not Heart. These two gals have taken not just a piece of their Rock ‘N’ Roll past for Red Velvet Car, they have taken it all and this album essentially salutes it with a double high five… throughout all ten songs. As I took a ride inside the Rock Music of Red Velvet Car, I not only took a ride into the Classic Rock past, I am also taking a ride into the Classic Rock present of Heart for as the legendary Bob Seger has sung… “Rock ‘N’ Roll never forgets”. Ann Wilson’s vocals on each and every song she sings comes through with the same spirit and resonance as the earliest of Heart albums. To listen to Heart’s 1976 debut album, Dreamboat Annie, immediately following Red Velvet Car is quite the Rockin’ treat, realizing that both albums are nearly 35 years apart is astonishing. The same can be said for Nancy Wilson’s guitar, being over three decades removed from Dreamboat Annie doesn’t seem real when the similarities in sound, style and fresh energy are so comparable. WTF has Nancy’s guitar tone emanating the feeling and desire of 1977’s Barracuda, making me wish I owned a vintage Chevy Nova jacked up and ready to go for that Summertime road trip to the beach. If WTF doesn’t grab you, then you have never listened to Heart before. Ann sounds as invigorated and Rockalicious as ever on the song Red Velvet Car… velvet vocals and all. If I am to drift off into Heart never, never land… then this is the song to bring me there. Alright, this is the “stand up” and get your groove on portion of Red Velvet Car… Queen City is now playing. When Ann cry’s out – “yo-ho, yo-ho gotta keep afloat” it’s enough to make me feel like Heart has taken back what once was old and made it new again. Let’s not forget that Nancy Wilson can sing with a sparkle like a dew covered peach in the morning Summer sun. Hey You is an acoustic, up-tempo, semi-sweet ballad that carries it’s Rock fragrance of Heart with it’s infectious melody and Nancy’s sweet harmony. Wheels and Safronia’s Mark both have the atmospheric sound and sensory feel of all things glorious about Classic Heart. Ann and Nancy please, take a bow now for you both have put me on a Classic Rock cloud that is drifting me further away from the lame-o and negative laced Rock Music that devoured everyone in the ’90’s. Hallelujah and Metal be thy name. I’m going to make it a point to listen to Death Valley and Sunflower, while laying on the grass of my backyard on one of these last hot Summer days… and stare up at the blue sky and puffy white clouds with a retro grin on my middle-aged face that stretches from ear to ear. Is it wrong for my classifying Red Velvet Car as a Classic Rock gem? Calling out Heart’s return to Classic Rock prowess? I don’t think so. 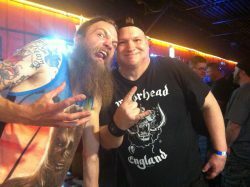 Exemplary Rock Music will always rise to the top, despite what is being played on radio or (gasp) MTV. Classic Rock exists for it will never go away, as it rears it’s triumphant head whenever a legendary band such as Heart brings it to life through their albums… both past and present with Red Velvet Car. Classic Rock has rescued me once again, thank you Ann and Nancy. Red Velvet Car has the Classic Rock ‘N’ Roll fuel and I’m telling anyone whose listening to hitch a ride. Heart has pulled up in their Red Velvet Car and taken me for ride that I’m looking forward to taking again on a consistent basis… for a very, very, long time. * I have not yet obtained any bonus tracks from the European release of Red Velvet Car, nor was I aware of the two bonus tracks found on the Target version of this CD, until it was too late. (I bought Red Velvet Car at f.y.e. before knowing of the “Only At Target” release).